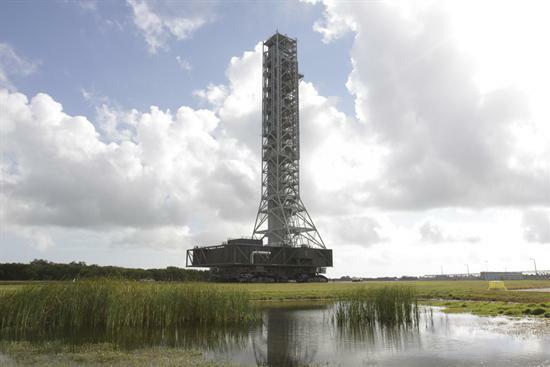 NASA’s mobile launcher mounted on a crawler-transport on its way to the launch pad in November 2011 (Credits: NASA). In November 2011 NASA moved its mobile launcher down the road to Kennedy Space Center’s Launch Pad 39B. The goal was to assess how the 355 ft tall structure, intended to support the Space Launch System (SLS), would hold up during the move. NASA has now completed analysis of the move and determined that the top of the tower swayed less than an inch in any direciton. “This gives us much higher confidence in the models,” said Chris Brown, lead design engineer of the mobile launcher. “We know that our approach is valid.” The results varied less than 5% from the motion predicted by NASA’s models. The same models are to be used in assessing the SLS structure now that they have been validated on the mobile launcher. The mobile launcher was transported on a crawler-transporter from the Vehicle Assembly Building to the launch pad. It is expected to make the same 6 mile trip each time an SLS launches. On the test run, accelerometers and strain gauges were attached to the structure to monitor the impact of several speed changes during the ride. A speed of 0.8 mph, for instance, was found to produce substnatial vibration, so it will be avoided in future transport. The mobile launcher tested was actually designed for the now defunct Constellation program for use with the Ares I rocket. The SLS is heavier and will require some additional strucutral support. Using the November test results, upgrades are being designed with a construction contract expected to be awarded this year. The mobile launcher should be ready for operational use in 2015. The video below reports on the November transport of the mobile launcher.